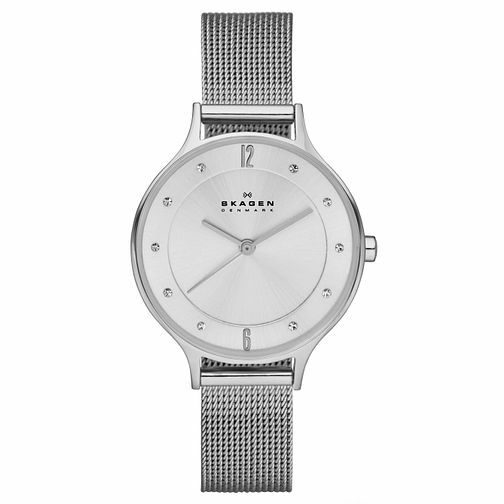 Embrace minimalist Danish design, with this sleek Anita stainless steel mesh bracelet watch by Skagen. Featuring a silver tone dial with stone set markers for just a touch of sparkle. Skagen Anita Ladies' Stainless Steel Mesh Bracelet Watch is rated 5.0 out of 5 by 1. Rated 5 out of 5 by Anonymous from Lovely watch Watch was a present for my mum in which she loved it, looks expensive and classy. Purchased express delivery which was delievered next day. However after purchasing from H.Samuel I found the same product cheaper in other shops.